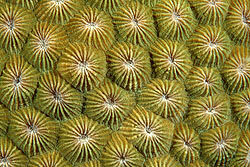 Coral is made by millions of tiny carnivorous animals called polyps. The polyps are usually only a few millimetres in diameter and live in groups called colonies.. A polyp is very similar to a tiny anemone, and consists of a stomach with a mouth at one end. The mouth is surrounded by a number of tentacles with nematocytes. They mostly feed at night. Although the polyps are predators, most gain their energy from zooxanthellae ( a type of algae) which live in the tissues of the polyps. The algae use sunlight and the polyp’s waste products to make oxygen and food for itself and the The algae need solar energy to survive, so do not live in deeper water. A polyp reproduces by dividing its own body to form two polyps or by producing sperm and eggs. Just after the full moon in November, eggs and sperm are released from coral polyps and float about for a few days. A small percentage of the eggs will be fertilized, hatch into larvae, and settle on the reef to begin new colonies. Colonies grow rapidly. 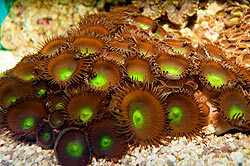 One polyp can become a colony of 25,000 polyps in 3 years. 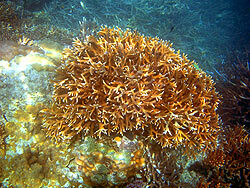 There are two types of coral, hard coral and soft coral. Hard corals (like brain coral and elkhorn coral) have hard, limestone (calcium carbonate ) skeletons which form the basis of coral reefs. 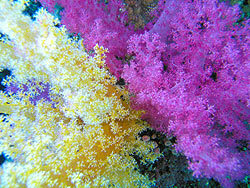 Soft corals (like sea fingers and sea whips) do not build reefs. Each polyp builds a case of limestone around itself, using calcium minerals and carbon dioxide from the water. This remains after it has died and forms a foundation for another polyp to build a house on, putting a floor on the roof of the old one. When these limestone formations increase, they are called a coral reef. The polyps are connected by a complex and well developed system of gastrovascular canals which allow nutrients to be shared. Coral reefs are the largest structures created by any group of animals in the world. They have existed on earth for over 200 million years. They grow in shallow (usually less than 60 metres), warm (18-33ºC), and clear water usually near land and mostly in the tropics. 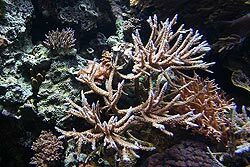 There are coral reefs off the eastern coast of Africa, off the southern coast of India, in the Red Sea, and off the coasts of northeast and northwest Australia and on to Polynesia. 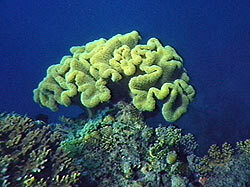 There are also coral reefs off the coast of Florida, USA, to the Caribbean, and down to Brazil. Reefs are extremely diverse marine ecosystems hosting over 4,000 species of fish, massive numbers of cnidarians, molluscs, crustaceans, and many other animals. 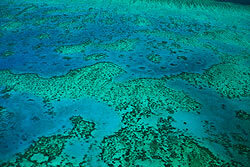 The Great Barrier Reef (off the coast of NE Australia) is over 2,000 km long and is the largest coral reef in the world. rare species of fish, coral reefs are in danger of being fished out and deserted. over a period of one to several nights around a full moon.